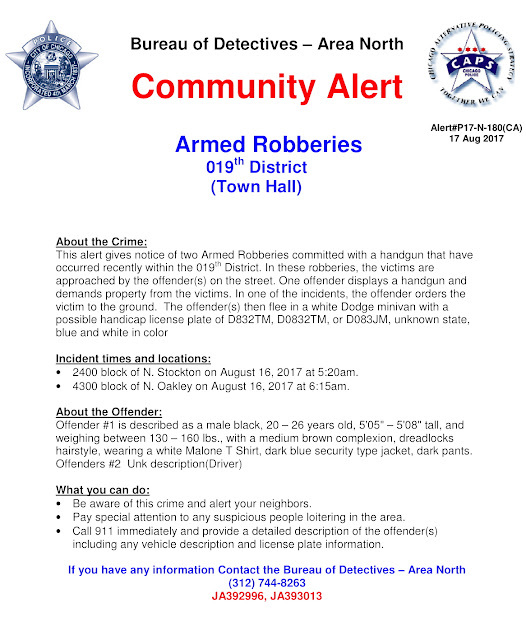 Chicago police have issued an alert to warn North Side residents about an armed robbery team that CWBChicago first reported on Thursday morning. 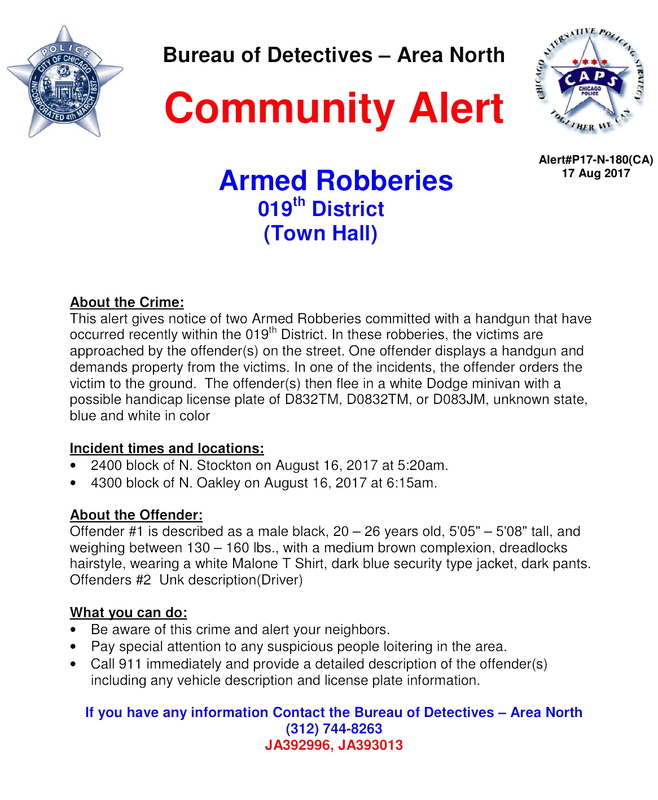 The warning confirms the connection between the robberies of two commuters—one in Lincoln Park and one in North Center on Wednesday morning. In those hold-ups, an armed man in a dinged-up white Dodge minivan robbed two commuters in separate muggings. Neither victim was injured. Among the new details in the police alert are the possibility that the getaway vehicle has a blue and white license plate of D832TM, D0832TM, or D083JM; and word that the gunman was accompanied by an unknown driver. As previously reported, a Lincoln Park man was robbed around 5:15 a.m. Wednesday as he waited for a 151 Sheridan bus in the 2400 block of North Stockton Drive. He told police that a man in a white Dodge Caravan drove up, pulled out a semi-automatic handgun, and demanded his valuables. About an hour later, a North Center man was targeted in a similar hold-up as he was getting into his car in the 4300 block of North Oakley around 6:20 a.m. Once again, an armed man pulled up in a white minivan and demanded the victim’s valuables. Police said the primary offender is described as a 20-26-year-old black man with dreadlocks or short braided hair. He’s 5’5” to 5’8” tall, weighs 130-160 pounds, and was last seen wearing a white Malone T Shirt, dark blue security type jacket, and dark pants.